It's crazy to think that it's only been 5 years. I feel like I've lived without adrenal glands for a whole lifetime! As you may know, from reading my blog, seeing me, or talking to me at any point in the last year, this has been the most challenging year of my entire life. I cannot believe I survived it. Let's go back to last September. I remember making a comment to my mom that I couldn't believe I had not been hospitalized once in 2014! I could not believe it. What an accomplishment that I had stayed healthy and dealt with minor issues on my own without needing an admission! It seemed like the moment I said that, the universe changed it's plans. After a few weeks of mentioning to my mom, sister, and maybe even coworkers that I thought my appendix was acting up, one morning before work I drove myself to the ER to get it checked. Sure enough, appendicitis it was. The surgery was pretty easy, and back to my life I went. In December, right before Christmas I got sick again. This time with the stomach bug. Back to the ER, and because of some low blood counts, I was admitted. A week later, back to the hospital I went for breathing difficulties. I stayed for 2 weeks, but no causes were found. In May, two admissions at two different hospitals for pneumonia. I have been on prednisone for many months, gained back some weight that I had finally lost last summer, had more than a few courses of antibiotics, more cardiac tests than I can count, chest x-rays, CT's, and appointments monthly. But, I survived. I still can't climb a flight of stairs without resting at the top. I take the elevator whenever possible. I have used my handicap parking permit more than I ever thought I would need too. I ask myself this same question every year; would I still go back and have a BLA? Yes, because I wouldn't be alive otherwise. 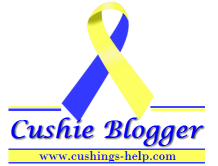 If you want to read more blog posts about my adrenalectomy, check out these links to past posts. Wow- five years. Hope things start getting easier. What a year... hugs!